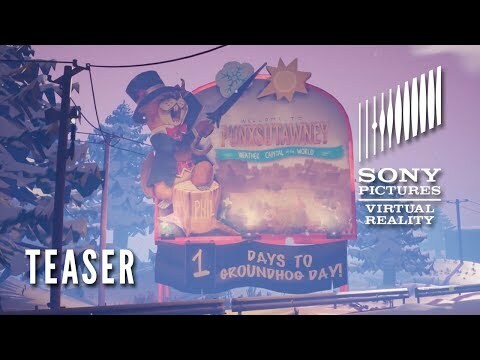 Groundhog Day: Like Father Like Son is a virtual reality adventure game. With over eight hours of hilarious puzzles and branching narrative gameplay, the story challenges you to think past today and break the time-loop cycle to escape into tomorrow. In Groundhog Day: Like Father Like Son you’ll play as the charming but arrogant Phil Connors Jr., who grew up in the shadow of his father—a man who spent a lifetime repeating a single day until he had made it perfect. But for Phil Jr., today is the worst day of his life. He’s trapped back home in Punxsutawney, the small town he thought he’d escaped, where he can’t even get a decent cappuccino—and he’s going to have to repeat the day over and over until he learns the true value of friends and family. The upcoming Groundhog Day: Like Father Like Son PC and PS4 release date is 2019 in the US and the UK. Notify me when Groundhog Day: Like Father Like Son is available.